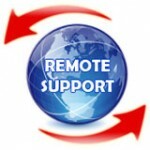 Only join support sessions with people you recognize and trust..
With our remote support assistance, our support team can quickly view, diagnose, and resolve technical issues on your computer. We utilize the latest and most reliable industry standards and infrastructure to ensure the highest level of security and privacy for our users. Please call us at 908-754-3855 befor you click on the D&T LLC Remote support Icon at the bottom of the page run the small application give us the code and we are solving your technical issues.